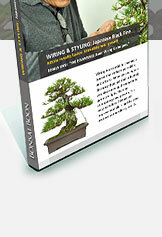 Wiring is essential to creating a bonsai that reflects your skills and efforts. When you wire, you do more than just train a bonsai; you also open up the interior of the tree to more light, thereby promoting growth. Boon Manakitivipart demonstrates beginner and advanced wiring techniques, all designed to help you produce show-quality bonsai. In the first DVD of this 2-DVD set, Boon wires and styles two Japanese Black Pines (75 minutes). In the second DVD, "THE ESSENTIALS: Basic Bonsai Wiring Techniques," Boon teaches you six basic wiring techniques (34 minutes). Together, these two, easy-to-follow DVDs will improve your skills, and help you produce extraordinary results.